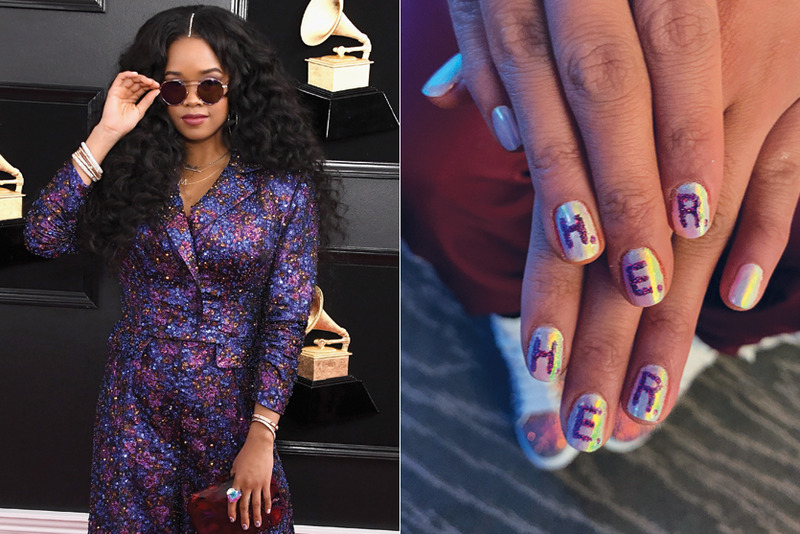 There was no shortage of nail art inspo to be seen on the 2019 Grammy Awards red carpet. To be sure, there was a manicure fit for every nail fan, from short and sweet, à la Anna Kendrick, to long and glittery as seen on Dua Lipa. 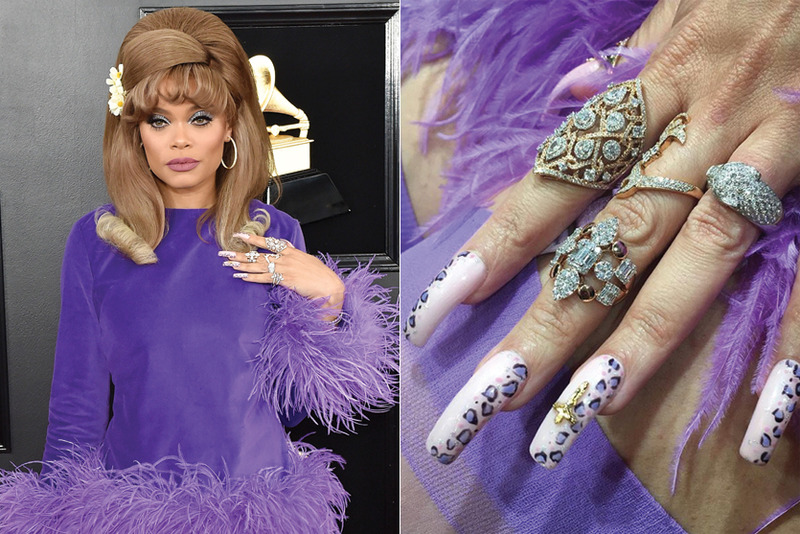 Here, a few of our favorite Grammy nail looks that struck all the right notes. 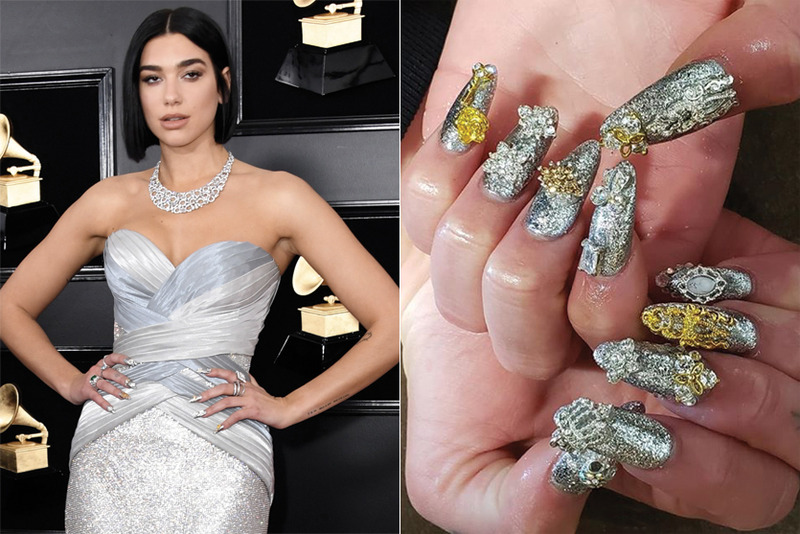 Best New Artist winner Dua Lipa sported an eye-catching manicure courtesy of Kimmie Keyees. She achieved the glitzy, textured effect by layering gray Defy & Inspire Gauntlet and glitter Crazy Kind of Beautiful before topping the nails with a liberal sprinkling of loose silver glitter and various silver and gold charms. Complementing her sparkling Coach jumpsuit, double Grammy winner H.E.R. displayed some self-love with a unicorn chrome mani by Chaun Peth inscribed with her name in purple glitter block letters. The dainty feathers in presenter Anna Kendrick’s pink Ralph & Russo mini dress provided the inspiration for her manicure by Michelle Saunders: two coats of shimmering white Essie Gel Couture Lace Is More topped with First View, Pink Diamond and No Place Like Chrome brushed onto the nails in featherlike strokes using a small fan brush. The finishing touch to Andra Day’s purple feather-trimmed ensemble? An animal print manicure by Kait Mosh, of course! To achieve the look, she applied two coats of OPI GelColor Let Me Bayou a Drink, and then painted a cheetah-print pattern on the nails with Lavendare to Find Courage; Ink; Show Us Your Tips! ; and Tinker, Thinker, Winker? before affixing a gold cross charm to each ring finger. 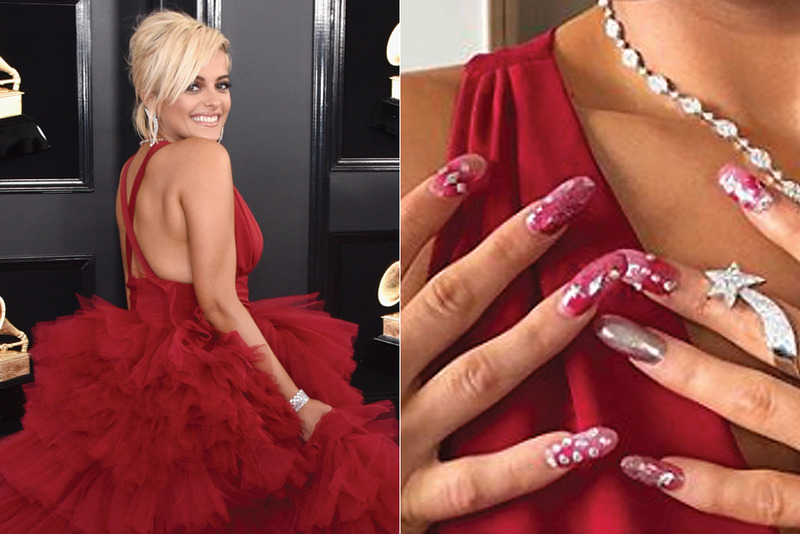 To complement Bebe Rexha’s frothy red gown, Barbra Warner created a sheer cherry ombré manicure using OPI Big Apple Red and Chrome Effects Tin Man Can, finishing the look with pearl and rhinestone accents.